Since beginning this Blog in March, many Issues have been addressed here that involved animals being harmed. Thankfully, being the kind and caring readers that you all are, you have responded with zest, zeal and passion. But the one topic that has evoked the most overt reaction, raw emotion and absolute disgust from all of you has been, mass animal murders. What has been written about here relating to this particular topic to date are: horses, elephants, gorillas and rhinos. There are other stories to be told, but not written about here yet, with past and future planned executions in this country, namely, wolves and bison or buffalo and of course, the Burmese Python In The Florida Everglades. 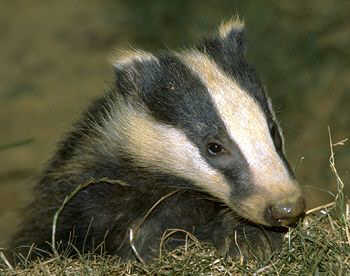 Now sadly, as of today, one more species can be added to this list: Badgers. To be completely honest, until this came to my attention here on Word Press, I knew nothing about this animal, but in the few short months here, I have witnessed a Global Outcry From Fellow Bloggers about what is being planned in England for this animal. For some unknown reason, certain humans seem to believe that it makes more of an impact, if the slaughter of a chosen victim is done is huge numbers, and for some odd reason, the last two discussed here, had the number 5,000. After reading the stated reasoning behind the proposed slaughter this August of Great Britain’s Badgers, the explanation for this action is that they believe it will reduce the number of cases of TB in the Cattle there. The Country has had an often times, ugly history with this animal, point in case being the now forbidden, Blood Sport Of Badger Baiting. For those of you not living in, or familiar with America, we have had a similar case like this with our Native bison, or buffalo in Wyoming. Years ago, Montana Ranchers began slaughtering bison or buffalo, just as soon as they left Yellowstone and wandered into their state because they feared the Bison were infecting, or could potentially infect, their cows with Brucellis abortis. And one final thought, a new story today, says that the upcoming CULL Of Badgers may not even be of any benefit at all, according to one of their very own. As the species with the supposedly larger brain, could we not at least consider ways to deal with animals that we seem to have a conflict with, other than mass murders? Come to think of it, our past history with other humans does not lend itself well to this, does it? This entry was posted in Animal Abuse, Animal Rights, Badger, Cull, Great Britain, Slaughter, TB, Wildlife, Wildlife Issues and tagged Animal Rights, Animal welfare, Atlantic Ocean, Badger, Badger Baiting, Brian May, Cull, Culling, England, Environment, Great Britain, Mass murder, Mother Earth, Slaughter, TB, Wildlife, Wyoming. Bookmark the permalink. I know that my reasoning is affected by my fondness for Badger in “The Wind in the Willows.” As I grow older, and even more curmudgeonly, I am even more drawn to that character. Thus, the proposed “cull” appalls me. Thanks for lending your voice to this voiceless animal. Funny, that was one of my daughter’s favorite books. And you need never explain your feelings for ANY animal here. Keep it coming, love to hear your thoughts. Thank you for writing about this nightmare. I also grew up loving Badger in Wind and the Willows. As I became older and began studying zoology, my fascination with them grew. I have seen only a few in the wild and will never forget. I always think Brits are smarter than Americans, but this is just as stupid as so many of our ignorant and cruel wildlife policies. I pray world attention shines on this so brightly that it will come to a halt. You knew that I would. Was waiting to see what would happen. It appears it is full steam ahead for the CULL! maltreatment of the innocents has become a Global Sin. And, we all have Blood on our hands. Welcome back. I am assuming all went well with the procedure? Just sent you an email. Did you get it? Yes, but there seemed to be a problem. Grrr, . . .technology. . .
this mail appears to be unsolicited. I’ll work on it later. Thanks. My mailbox was bulging with thousands of emails, but I have deleted a thousand. I also have just received two emails. Could you try forwarding yours to me again? Sorry for the trouble . .Anne. Nothing on anne.t.bell@gmail.com and I have lots of messages. Could there be another email address for me somewhere? What a mystery! That is where I sent it to. Anyway, we are home and all is well. Queen, my favorite group of all time. Miss Freddie, have his Bio on Dish, love it. Last year, while traveling by train to Wyoming to do sacred work with bison, I was fortunate to meet a couple from England who were also animal enthusiasts. They were appalled at the idea that the badgers that visited their gardens were to be killed, and adamant that they would not allow it in their back yard. I am hoping that there are many others who share their determination. It is more than time to see this issue for what it is, prejudice based on fear rather than science. And if it were possible to have science be the basis for government policies the next question to consider would be whether we should be raising cattle at all. Man-made domesticated cattle cannot safely give birth without our assistance, and in this country they are not able to survive harsh winters without support, unlike native species. If we switched back to eating bison (and allowing them to roam freely) we could restore the prairies and our health. England has a variety of bison as well, although without the extensive wild lands that thankfully we still have some of. It is unlikely that such a policy will be implemented at a government level either here or in England any time soon without the intervention of the public. My suggestion for people in both countries is to support local farmers and stores who are willing to support working with wildlife rather than against. And the only way they will have that awareness is if we, the consumers, tell them our intentions, verbally and with our dollars. Every purchase you make is a vote for the future you want to see for wildlife. Oh, can I hear a great BIG AMEN!!!!!! Have been with the bison/buffalo a multitude of times in South Dakota, Yellowstone and other places. but then that was the true reason for Buffalo Bill and his slaughter of one of the most beautiful creatures ever to walk on Mother Earth and a nearly 100% decimation. From a shamanic perspective prayer and ceremony have power to affect positive change. Keeping all wildlife – badgers, bison, wolves, etc. – in our daily prayers can help. The animals need us now more than ever. Thank you for your compassionate comment. Hey I have something for you..
Have a look and I think you will love it…. I had not heard about badger baiting! but sadly I am not surprised…. we have a way of mucking everything up, don’t we? Neither had I until I started writing this. It is sickening and disgustingly sad. It most certainly is, thank you! Very well written, and I have once again learned much from your post was well as the comments you gather from passionate supporters. While I feel helpless I think supporting local farmers who work with the environment and wildlife is a step in the right direction, the suggestion of WildReikiShaman. Not to mention I’m leaning toward giving up meat altogether. Stay strong Gator Woman. Your comments always make me want to work even harder. What would I ever do with out the support and positive attitude that you bring here? You are super kind but it’s your passion that has shed a light on such difficult, inhuman behaviors. It takes a warrior’s spirit and heart such as yours. So I thank you sincerely. Thanks for letting us know about this issue! I can’t believe culling is even legal anywhere! Thank you Tanya, it should not be. Thanks so much for writing on this…. I’ve been reading about it for awhile. 😦 And I agree with Son of Sharecroppers: I think of “Wind in the Willows” and all those marvelous naturalist authors / illustrators who embraced their surroundings, including Badger. As a species, we seem to have gone completely the wrong way, sometimes. So nice to see your sweet face here! And yes, we have gone a lot nuts when it comes to animals! Interesting post, thanks for writing it. I appreciate that you are an animal lover and very passionately so and I respect that greatly. As is so often the case with wildlife debates, it is sometimes difficult to seperate the emotive arguments from the scientific ones. Looking at the following point: “After reading the stated reasoning behind the proposed slaughter this August of Great Britain’s Badgers, the explanation for this action is that they believe it will reduce the number of cases of TB in the Cattle there. Whilst noone would argue that Badger Baiting was cruel and awful, iI dont personally think it has any relevance to the issue of badger culling. By bringing up baiting, you are clouding an important scientific debate with and irrelevant and emotive issue. Hwoever, I say again that greatly respect your passions and enjoy your blog. I will continue to read it, perhaps, if I post more about things that interest you, you might continue to check out mine!